This committee, which functions under the supervision of the Rear Commodore, is responsible for planning for future Club facilities and services, primarily on the long range basis. This committee is required to report at each regular Board meeting. The Long Range Planning Committee Chair also serves as an active member of the Board of Directors. Bob and Pat have been married for over fifty years and raised their four children in Franklin Lakes, NJ. They have ten grandchildren ranging from five months to twenty years of age. In 1962, Bob enlisted in the United States Navy serving in the engineering division aboard the US Willard Keith DD775, a WWII destroyer, which took part in the Cuban missile crisis and blockade operations. He subsequently served as a Paterson police officer, criminal justice planner, and as a commissioned special agent with the United States Secret Service. In addition to presidential protective duties, he conducted and supervised criminal investigations of fraud, forgery and counterfeiting. He started his own litigation support company in 1985, which included forensic fraud investigations and executive protection. He returned to graduate school earning masters degrees from Seton Hall University and Fairleigh Dickinson University in supervision and administration in higher education and in public administration. Bob taught supervision and administration courses at Seton Hall in the State Police Graduate Studies Program. He also taught undergraduate courses in the criminal justice program. Prior to his semi-retirement, he taught full time as an assistant professor of Law and Society at Ramapo College of NJ. For ten years he taught strategic planning as part of the Community Oriented Policing Program for the Department of Justice. Bob attended the Ocean Navigator School of Seamanship at Woods Hole, MA and received his USCG License (6-pack) for near coastal waters up to 100mi. 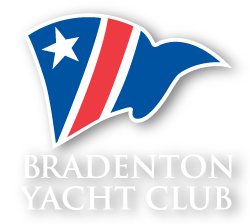 Following Pat’s thirty eight year teaching career, she retired, and they found their piece of paradise in Sarasota and a new home port for their Pearson 38, Maiden USA II, by joining the BYC family in 2011. Wishing to give back to the community, Bob joined the USCG Auxiliary where he was appointed staff officer for member training and public education. He achieved certified instructor status and taught boating safety at Bradenton Flotilla 81 and at State College of Florida campuses. Bob continues to operate a successful law enforcement and security management-consulting firm.